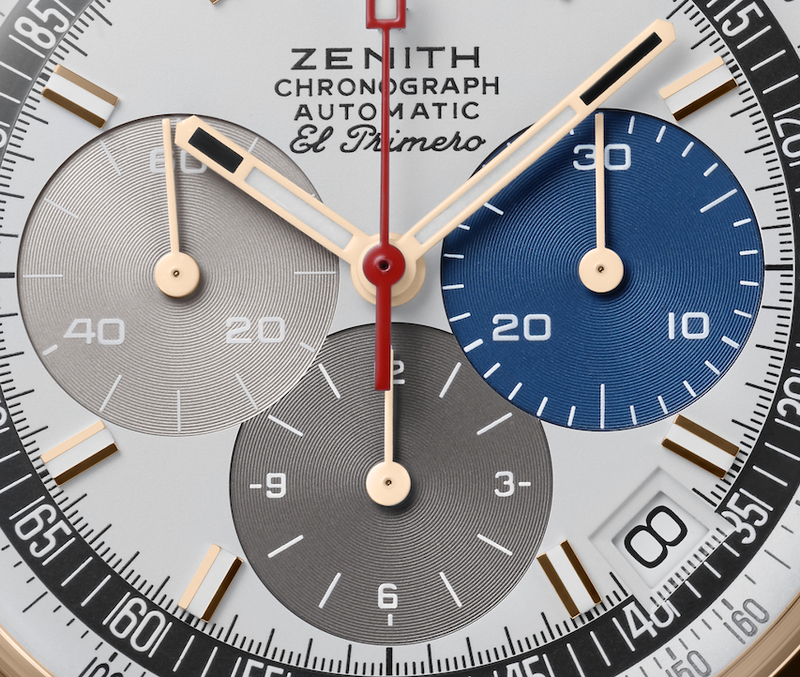 A revival of the first ever El Primero model from 1969. The case, in 18kt yellow, white or rose gold, measures 38mm x 12.6mm. It has a box AR-coated sapphire crystal, a sapphire display back, and it is water resistant to 100 meters. 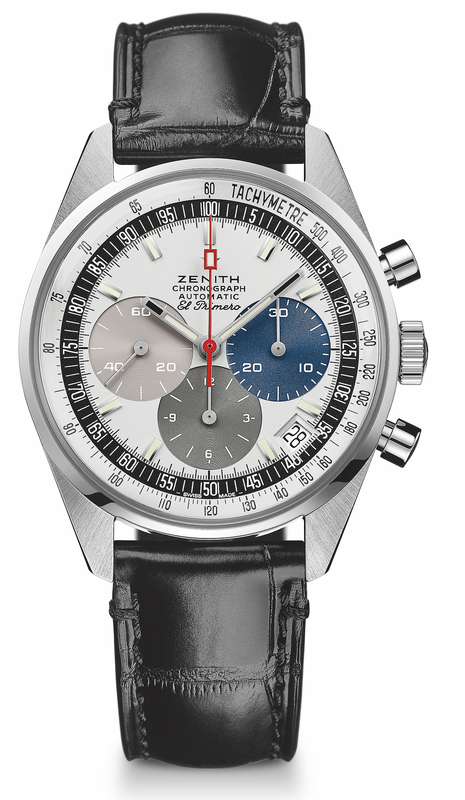 Movement is the Swiss automatic Zenith in-house caliber El Primero 400 with 31 jewels, 36,000 vph and a power reserve of 50 hours. Rotor with Côtes de Genève" decoration. Functions are: hours and minutes in the center, small seconds at 9 o'clock. Chronograph: central chronograph hand, 12-hour counter at 6 o'clock, 30-minute counter at 3 o'clock.Tachymetric scale and date indication at 4:30. It has a white-lacquered dial with three colored counters. Rhodium-plated or gold-plated faceted hour markers with SuperLuminova. Rhodium-plated or gold-plated faceted hands with SuperLuminova. It comes on a black or brown alligator leather strap with protective rubber lining and an 18kt matching gold buckle. 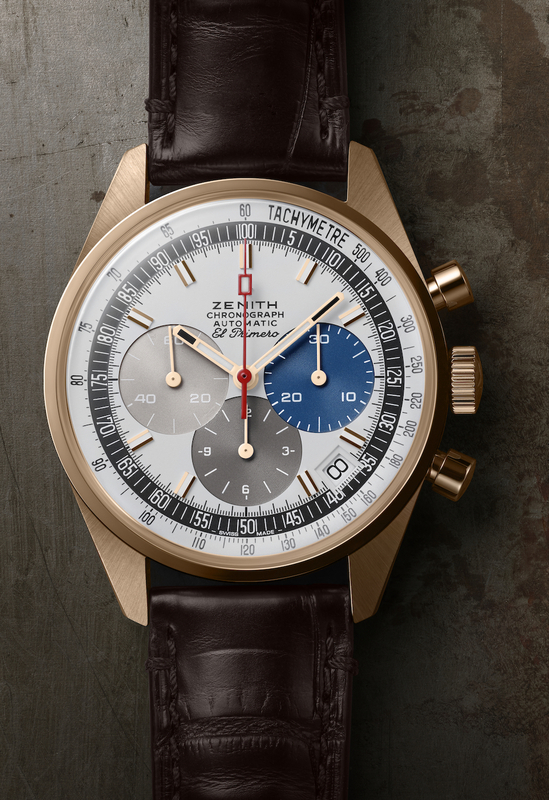 It is delivered with a bright red travel pouch, like the original model from 1969, as well as a microfiber cloth adorned on one side with an El Primero chronograph movement plan and on the other with a picture of the original user manual. Previous Topic: Pilot Doublematic - Discontinued, why? Next Topic: Baselworld 2019 - Zenith Defy Inventor with 129,600 VPH!